Quiet sleep is the key to a good rest, which allows you to effectively recuperate, give a charge of vigor and energy. For a comfortable sleep it is necessary to take a responsible approach to the choice of bedding. Properly selected pillow will allow you to take an anatomically correct position of the head, relieving the neck of tension during sleep, will not interfere with normal blood circulation. Comfortable blanket - a guarantee of comfortable body temperature during rest. From what kind of filler will be in the pillow and blanket depends on how serene sleep will be. Synthetic materials are replacing traditional feathers with feathers, among which artificial swan's down is especially popular among modern residents. Durable material with excellent wear-resistant characteristics does not accumulate odors and is not attractive to parasites (ticks and harmful microorganisms). But only proper care guarantees the preservation of the elasticity and shape of these products with such a filler. 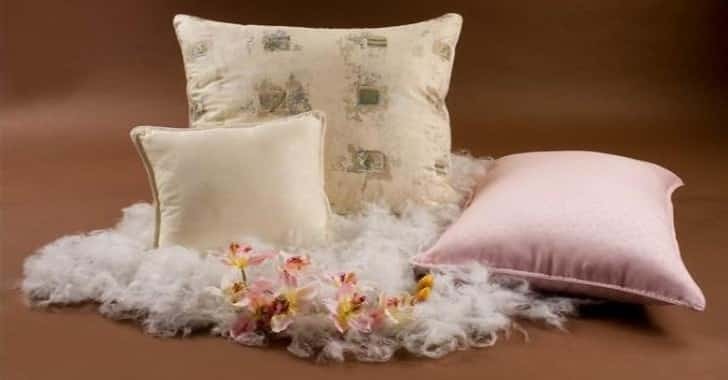 Not for nothing pillows made of artificial filler are popular, because having excellent quality characteristics, they do not require such care as products made from natural materials. When purchasing bedding from 100% polyester, it is necessary to familiarize yourself with how to wash pillows from artificial swan down in order to use comfortable items as long as possible. The most delicate and thinnest microfibers, which resemble fluff in quality characteristics, easily take shape, providing maximum comfort during sleep. The advantages of the filler with a spherical structure of fibers is also attributed to the fact that products with this material can easily withstand both hand and machine washing. Tips, how to wash pillows with swan's down, so that the filler does not get stuck together in lumps, and keep lightness and airiness for a long time. spinning is allowed, but it is not possible to dry the swan-down pillow in the drum. After washing, the product should be placed on a horizontal hard surface, pre-capping one-colored cotton fabric. 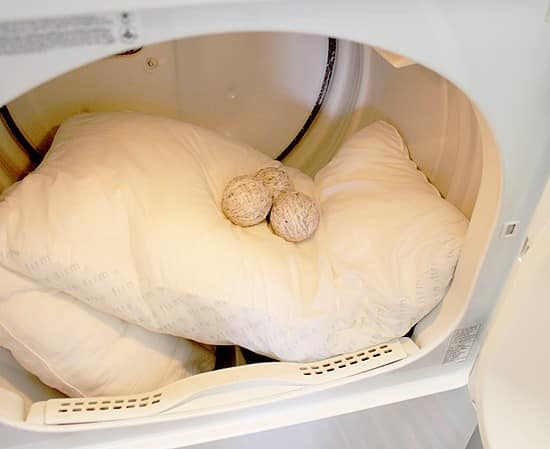 It is recommended to dry the pillow in a well-ventilated area, occasionally turning it over and shaking it. Iron the product can not be ironed, because it can damage the structure of the fibers. You can tidy up your favorite pillow without a washing machine. For this you need to make some effort. Care should be taken of the spacious tank in which the pillow should fit. Big basin, trough or bath. Water temperature should be up to 40 degrees. Carefully studied the information of the manufacturer on the label. Special attention is paid to approved detergents that need to be diluted in water, foaming it. A pillow made of artificial fluff is immersed in a container with water, the product extends with promayuschim movements. In several waters, the pad is rinsed. An air conditioner can be added to the water so that the fibers are smoothed out faster and the product can get its original shape without losing elasticity. The pillow is gently wrung out, do not twist it. Allow any residual moisture to flow by placing the product on a lattice base. Dry in a horizontal position, without hanging the product. Sometimes the housewives, knowing how to wash the swan's down, prefer to give the pillows to dry cleaning. But it should be remembered that only specialized reagents can be used to clean the surface of the product. Also, to make your sleep peaceful, it is recommended to air the pillow in the open air at least 2-x once a year. This allows microfibers to be saturated with oxygen, eliminating dust from the product. Proper care is necessary and large bedding, such as blankets. Knowing how to wash a pillow of swan's down, owners of a blanket with the same filler can easily achieve its perfect sanitary condition. Despite the dimensions of the product, it can also be washed in a typewriter. The optimal temperature regime of washing - 30-40 degrees. It is forbidden to use aggressive detergents that can spoil the blanket. Spin using a centrifuge is not contraindicated. Taking out the drum, the blanket is well shaken. Interested in how to wash a blanket of swan's down by hand, can do it in a bath with soapy water, where the thing is placed. Stains are previously displayed. For this, an individual remedy is selected based on the characteristics of the contamination. Use in a typewriter drying mode is prohibited. The washed blanket is dried after pressing in straightened form. 100% polyester does not attract parasites and harmful microorganisms. Timely washing, airing, cleaning of products from swan down guarantees a cosiness and comfort during a dream. Pillows and blankets made of soft, but at the same time elastic material, washed according to the rules, will delight owners a long time. It helps me a lot to wash the products from down, not only pillows, but also wearable things — use of tennis balls. Well, it is harder and longer to shake, to chase a thing!